Launched in partnership with Green For All and the Hip Hop Caucus, the nationwide campaign will rely on a coalition of organizations to educate and mobilize young people about how to take action on things like installing energy-efficient light bulbs in neighborhood homes, planting a community garden, and writing letters to local officials asking them to promote the use of more fuel efficient vehicles. 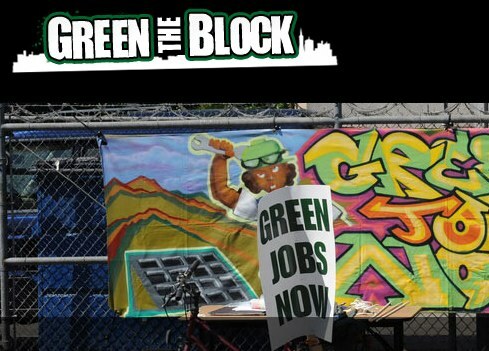 Green the Block is just one example of how youth culture — and in particular, hip hop culture — is transforming the way we advocate for sustainable cities and transportation. And it’s not just in the United States. “I love the art of hip hop; I don’t always love the message of hip hop. The thing about hip hop today is that it’s smart, it’s insightful, the way that [rappers] can communicate a complex message in a very short space is remarkable. A lot of these kids are not going to be reading The New York Times. The question, then, is, what’s the content? What’s the message? Barack “B-Rock” Obama meets with Ludacris. Photo via Snicka. 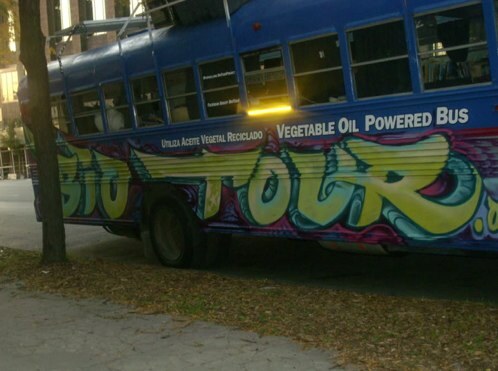 The BioTour bus was tagged by a local graffiti artist on its journey through Brooklyn in October 2008. Photo via Green the Ghetto. In Johannesburg, South Africa, a group of young people hosted breakdancing performances in a local movement known as Underground Soccer (UGS) to spread an anti-litter awareness campaign to cleani up the city’s central business district. 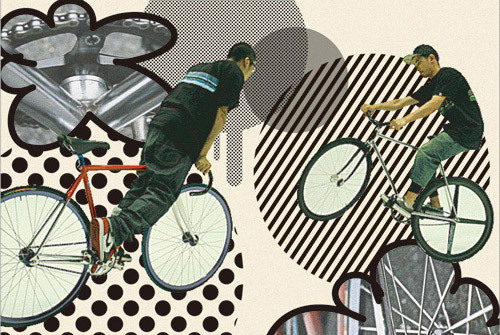 In the realm of active transportation (i.e bicycling and walking), breakdancing is also visible in a new trend: back riding, skids, back circles, lift ups and wheelies…all sorts of insane tricks you can do on “fixies,” or fixed gear bicycles. In San Francisco, “scraper bikes” — bicycles that are tricked-out with big wheels and outlandish colors — have developed a cult following of inner city kids. Imagine if everyone thought bikes were that cool — sustainable transport wouldn’t just be for hipsters, skaters and bikers anymore. Now if only rappers would get rid of their huge gas-guzzling cars, like Redman, who rode a 45 mpg smart fortwo in his “Run My Block” video. YOPS, a Japanese skater/biker crew, created an instructional DVD about how to do tricks on a fixed gear bike. Image via Hypebeast. People like J-Mull and C-Diddy, the duo behind Greenrapper.com, highlight positive solutions, like electric vehicles and biodiesel, through the power of busting rhymes. Whereas grafitti is usually seen as ugly vandalism, some places have learned to embrace it. Inhabitat reports on “reverse graffiti” in the UK and Brazil, where street artists scrub out grime and soot from city walls to display positive messages like “wash me” or “go gently.” And check out these eco-friendly “moss graffiti” murals that help to beautify a neighborhood. 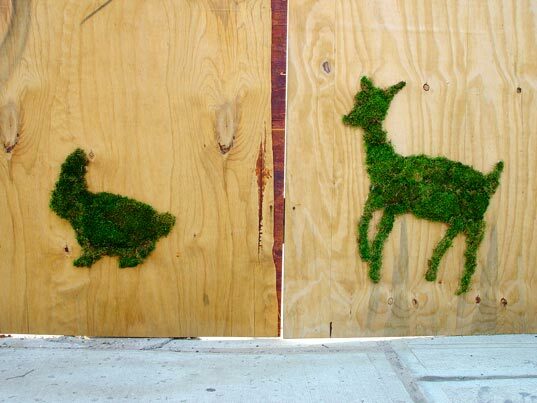 Moss graffiti in Brooklyn, New York by street artist Edina Tokodi. Photo via Inhabitat. Other artists take to old-fashioned pen and ink. Los Angeles-based cartoonist and rapper Keith Knight portrays the perils and frustrations of his hometown’s car culture and lack of adequate public transportation in his edgy “underground comix” style, showing that urban mobility is not just a topic for unimaginative transport planners to discuss in boring town hall meetings or technical reports. Illustration by Keith Knight via WireTap magazine.